Dana-Farber Cancer Institute scientists in Boston and colleagues have developed a mathematical model to predict how a patient's tumor is likely to behave and which of several possible treatments is most likely to be effective. Reporting online on January 23, 2014 in an open-access article in the journal Cell Reports, researchers combined several types of data from pre- and post-treatment biopsies of breast tumors to obtain a molecular picture of how the cancer evolved as a result of chemotherapy. "Better understanding of tumor evolution is key to improving the design of cancer therapies and for truly individualized cancer treatment," said Kornelia Polyak, M.D., Ph.D., a breast cancer researcher in the Susan F. Smith Center for Women's Cancers at Dana-Farber. The model was developed by Dr. Polyak and Franziska Michor, Ph.D., a computational biologist at Dana-Farber. The study analyzed breast cancer samples from 47 patients who underwent pre-operative chemotherapy to shrink the tumor so it could be removed more easily. The biopsy samples, representing the major types of breast cancer, included specimens taken at diagnosis and again after the chemotherapy was completed. As has been increasingly recognized, a tumor contains a varied mix of cancer cells and the mix is constantly changing. This is known as tumor heterogeneity. The cells may have different sets of genes turned on and off – phenotypic heterogeneity – or have different numbers of genes and chromosomes – genetic heterogeneity. These characteristics, and the location of different types of cells with the tumor, shape how the cancer evolves and are a factor in the patient's outcome. In generating their predictive model, Drs. A recent study reports the development of a new mouse model for atopic dermatitis, an inflammatory skin disorder commonly known as eczema. 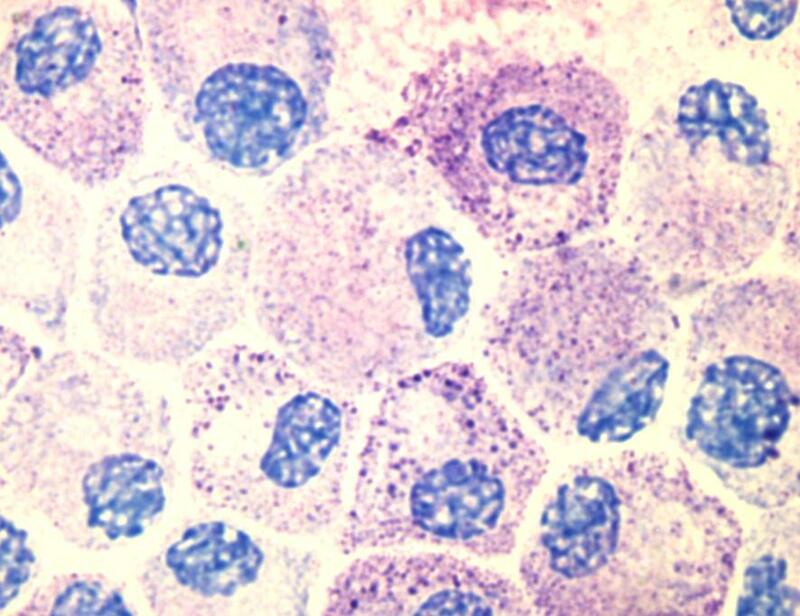 The findings, published online on January 9, 2014 in an open-access article in Cell Reports, suggest that mast cells (image), a type of immune cell, are critical for both spontaneous and allergen-induced eczema. The study, led by researchers at the La Jolla Institute for Allergy and Immunology in the United States and including researchers from the Laboratory for Allergic Disease at the RIKEN Center for Integrative Medicine in Japan and other institutions, was supported in part by the National Institute of Allergy and Infectious Diseases (NIAID), a component of the National Institutes of Health. Eczema is estimated to affect approximately one in five infants and one in fifty adults in the United States. The causes underlying the disorder are unclear. Previous research has suggested a role for imbalanced immune responses and impaired skin defenses, as well as overproduction of thymic stromal lymphopoietin (TSLP), a protein that promotes inflammation. While different mouse models for eczema have been developed, research examining how they are linked to human disease is still ongoing. In the current study, researchers show that mice lacking phospholipase C-beta3 (PLC- beta3), an enzyme that helps regulate inflammation, develop a skin disorder similar to human eczema, with high levels of TSLP. In this model, disease progression depends on the accumulation of mast cells and the activity of a signaling protein called Stat5. This role for mast cells and Stat5 in eczema was not previously known. The researchers also examined skin lesions of eczema patients and found that some had accumulation of mast cells expressing active Stat5. A landmark study across many cancer types reveals that the universe of cancer mutations is much larger than previously thought. By analyzing the genomes of thousands of patients' tumors, a Broad Institute-led research team has discovered many new cancer genes — expanding the list of known genes tied to these cancers by 25 percent. Moreover, the study shows that many key cancer genes still remain to be discovered. The team's work, which lays a critical foundation for future cancer drug development, also shows that creating a comprehensive catalog of cancer genes for scores of cancer types is feasible with as few as 100,000 patient samples. "For the first time, we know what it will take to draw the complete genomic picture of human cancer," said Broad Institute founding director Dr. Eric Lander, a senior co-author of the paper. "That's tremendously exciting, because the knowledge of genes and their pathways will highlight new, potential drug targets and help lead the way to effective combination therapy." Over the past 30 years, scientists had found evidence for about 135 genes that play causal roles in one or more of the 21 tumor types analyzed in the study. The new report not only confirms these genes, but, in one fell swoop, increases the catalog of cancer genes by one-quarter. It uncovers 33 genes with biological roles in cell death, cell growth, genome stability, immune evasion, as well as other processes. The researchers' results appear in print in the January 23, 2014 issue of Nature. "One of the fundamental questions we need to ask ourselves is: Do we have a complete picture yet? Looking at cancer genomes tells us that the answer is no: there are more cancer genes out there to be discovered," said the paper's first author Dr. Mike Lawrence, a computational biologist at the Broad.